The Welsh Springer Spaniel requires a significant amount of physical activity, which can be satisfied with a lengthy walk or active play session in the yard or in the field. It is best suited for an owner that enjoys a good hike or a day out in the field. The Welsh Springer Spaniel is best suited for an environment where it can experience both the indoors and outdoors on a regular basis. The coat of the Welsh Springer Spaniel requires brushing one to two times per week and may require the occasional cut to straighten out stragglers. The major health concern for the Welsh Springer Spaniel is CHD, or Canine Hip Dysplasia. This disorder affects the hip and may cause issues with hip development. Some of the minor health concerns of this breed include glaucoma, otitis externa, and epilepsy. On occasion, cataracts are seen in the Welsh Springer Spaniel. In order to keep the Welsh Springer Spaniel in good health, regular testing of the hips and eyes should take place. A healthy Welsh Springer Spaniel will live for 12 to 15 years on average. The Welsh Springer Spaniel is identified in some of the original records from the Laws of Wales dating all the way back to around the 1300s. It is not known whether or not this dog is the predecessor of today’s Welsh Springer Spaniel. 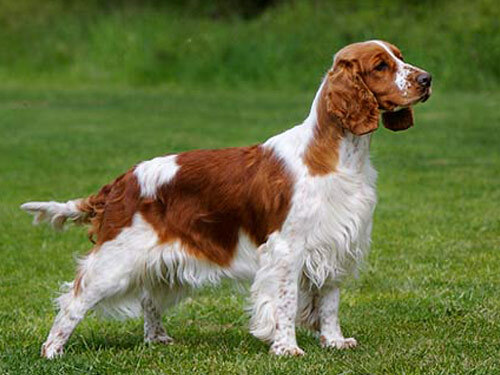 There are others theories that indicate the Welsh Springer Spaniel may have come from a cross between English Springer’s and Clumber Spaniels. Before the Welsh Springer came to be a recognized breed, land spaniels appeared in Wales for some time. During the early England dog shows, the Welsh Springer was shown along with the English Springer. The only difference between the two breeds was their coloring. The Welsh Springer gained popularity over time and eventually arrived in America and became AKC recognized by 1906. However, the popularity did not remain in America and it is possible that at the end of World War II that the Welsh Springer Spaniel was extinct in America. The combination of new imports and supporters saved the breed and since then the Welsh Springer Spaniel has had a modest popularity. While the Welsh Springer may not be as showy as the English Springer, it more than makes up for it in the field with its ability to hunt in all terrains including in land and in water.